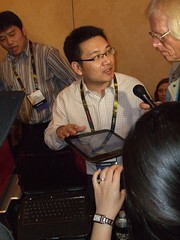 One of Lenovo’s product team demos the Lenovo U1 at CES 2010. This was among the most impressive of the show’s innovations and offers users the benefits of a full computer along with a removable touchpad which is a full blown computer as well. The system uses two separate processors and my understanding is that each unit can act independently, so you could hook up a separate monitor to the keyed portion. The hybrid is not yet available and will appear after Apple’s much celebrated iPAD and other tablet innovations, so it’s not clear how the coming tablet wars will shake out. Apple has a remarkable record of bringing beautiful and innovative product to the market, having them copied and offered at lower cost, and still winning the war for the hearts and minds of users. However Apple already cut the price on the iPAD and on Apple eBooks in an effort to knock the Amazon Kindle out of the competition for the tablet/ebook market so their margins are likely very thin. If Lenovo’s production costs are much lower (they likely are), they may find this market more profitable than Apple and thus be able to expand more quickly. All this is very speculative until we see how consumers react to the new products as well as the many other tablets in the pipeline. At this point it appears likely that Lenovo will be Apple’s key competitor – and only if they are lucky and the product works as well as advertised at CES – in the 2010 tablet market. Note: Aria Resort, Vdara Hotel, and Crystals were sponsors of Technology Report’s 2010 CES Coverage. We appreciated that these remarkable properties – which rank among the world’s most technically advanced hotels and retail center – helped us bring you our live CES 2010 coverage.